Toy Story fans! Have you ever wanted to shrink down to the size of a toy and play along with your and be on of Andy's toys? Well, pretty soon you are going to be able to "shrink" and visit with your favorite pals from Andy's room at Toy Story Land opening in Disney's Hollywood Studios June 30th, 2018. This is going to be the park to visit that is for sure, because who doesn't love Toy Story? This is a movie many have grown up watching and I know it holds a special place in my heart. 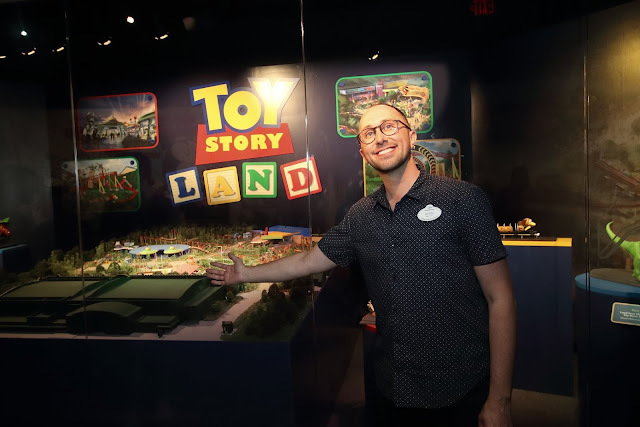 Recently at the Disney Media Moms Conference, we were able to get a sneak peek of a model of Toy Story Land and to hear more about the land from an Imagineer who got to work on the land itself, Ryan Wineinger, an Art Director, at Walt Disney Imagineering. We got to hear a bit about the land and all of the cool stuff that is going along with it, and check out a cool miniature set up of the land showcasing all there is to come! We saw a tiny version of the upcoming rides, Slinky Dog Dash, Alien Swirling Saucers, and an updated Toy Story Mania! Slinky Dog Dash. Andy has assembled his roller coaster kit for maximum family fun. Tracks and supports in bright colors of red, orange, yellow and blue are put together according to Andy's hand-drawn plans, with Rex and Jessie lending a hand. And to complete his creation, Andy picked up everyone's favorite floppy-eared dachshund with a strrrrretch-ing slinky coil belly and dropped it on to the coaster track. Get ready to ride inside Slinky Dog's coils! Slinky Dog Dash is inspired by the delightful pooch spinoff of Slinky, the 1950s American toy classic. Riders of all ages will delight as Slinky Dog bends and twists his coils around curves, hills, bridges, and drops in the Slinky-est coaster ever. Fun for the entire family. Alien Swirling Saucers. Brace yourself for out-of-this-world thrills because the aliens have powered up their flying saucers! Alien Swirling Saucers will immerse guests in the playful world of Andy's toys. This galactic space toy is designed as a play set that Andy won at the Pizza Planet restaurant. Adorable little Toy Story green Aliens swirl about in their flying saucers with guests in tow in their rocket-ship toys, while "The Claw" hangs overhead. This space adventure is bathed in music reimagined for intergalactic fun, dappled with multi-color lighting and sound effects from throughout galaxies. Toy Story Mania! While Andy's away, the toys will play. One of the most beloved attractions at Disney's Hollywood Studios, Toy Story Mania!, gets an all-new colorful toy carnival game box entrance when the new land opens. In fact, this is the box that the Toy Story Mania! the game came in. Recently updated with a third track, the popular attraction will put even more guests in the carnival playset action taking aim at 3D objects – using everything from baseballs to cream pies – in a variety of whimsical, fast-paced games. To the high-scorer go bragging rights. Woody's Lunch Box will serve up tasty meals and old-fashioned soda floats from a walk-up window in a setting surrounded by Andy's favorite toys and a giant vintage thermos. Woody's Lunch Box will also feature Mini Babybel – the Official Snack Cheese of Walt Disney World Resort. 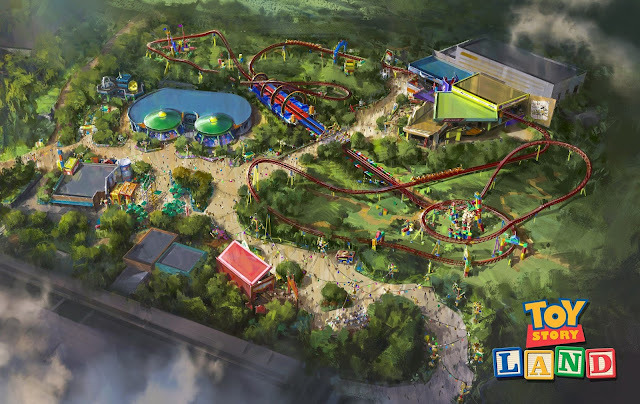 From some cool new rides to yummy on-the-go refreshments, Toy Story Land will have it all. My family and I are most looking forward to riding Slinky Dog Dash. We were able to ride the Slinky Dog ride at Disneyland Paris, but the Paris version was a bit more of circular spinning ride, not the large coaster that the Florida Slinky Dog will be. It looks to be massive, covering one side of the park to the other it is going to be amazing. The Disney Blog posted a time lapse video of one of Slinky Dog Dash’s first test runs be sure to check it out below. During the Disney Media Moms conference we were also treated to a fantastic Pixar breakfast, and as a part of the breakfast we got to meet some of the toys themselves, Buzz and Woody! Meeting these fun toys made us even more excited to visit this special land. The 11 acre Toy Story Land opens on June 30th, 2018. Are you excited? I am ready to order my Fastpass Plus passes for Alien Swirling Saucers and Slinky Dog Dash for our upcoming visit to Walt Disney World in August! Only a few months to go we can’t wait. Are you excited to visit Toy Story Land? 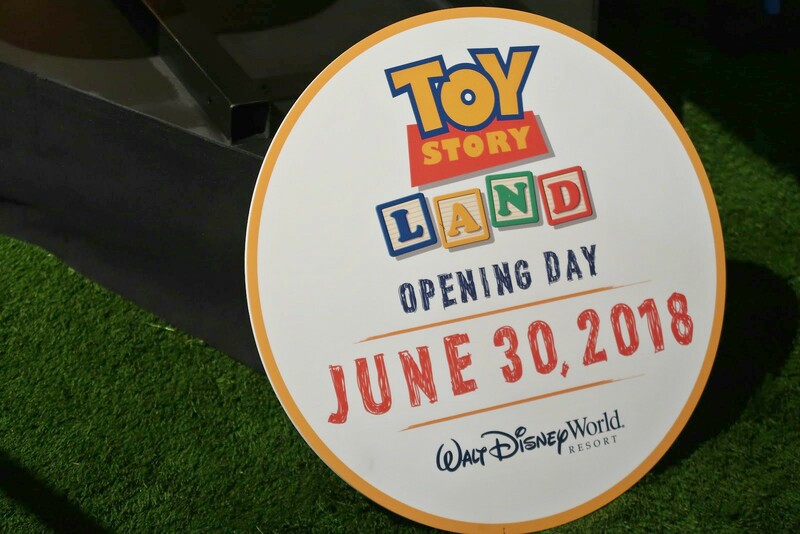 Toy Story Land opens in Disney’s Hollywood Studios on June 30th, 2018.